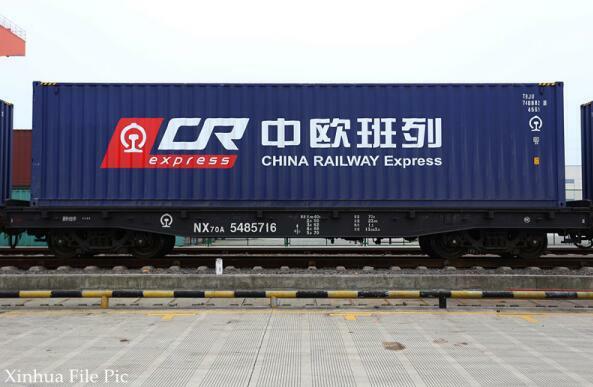 CHENGDU, Aug. 24 (Xinhua) -- A new freight train service linking southwest China's city of Chengdu with Alma Ata, the largest city in Kazakhstan, was launched Wednesday. A train carrying air conditioners, elevators and excavating equipment departed from Chengxiang central railway station in Chengdu Wednesday evening and will travel eight days to reach Alma Ata. The route, part of the China-Europe route, serves the customized needs of companies in both cities and will operate regularly in the future, according to Zheng Shuangli, operation supervisor of Chengdu International Railway Port Investment and Development Co. Ltd.
China-Europe freight trains made 2,490 round trips in the first half of 2018, growing 69 percent from a year ago, according to statistics released last month by China's State Council Information Office. Data also showed that the number of trains returning from Europe doubled in H1. The number of categories and quality of the goods have also been increasing.